MADISON – Today, Governor-Elect Tony Evers announced key leadership personnel for his Transition Team and the Office of the Governor. Maggie Gau, Governor-Elect Evers’ campaign manager, will become Governor-Elect Evers’ Chief of Staff. JoAnne Anton will serve as Transition Director, and Transition Team Co-Chairs who will assist with recruiting and appointing members of Governor-Elect Evers’ Administration and developing priorities for his first-term agenda. 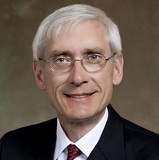 Governor-Elect Evers will announce additional Transition Team members and the leadership team for his Inauguration Committee in the coming days. Maggie Gau, originally of Wausau, Wis., will become Governor-Elect Evers’ Chief of Staff in the Governor’s office. 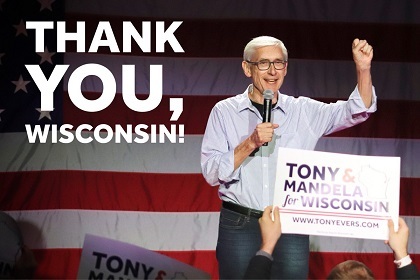 Before managing Governor-Elect Evers’ campaign for governor, Gau formerly served as Chief of Staff for State Representative Chris Taylor (D-Madison) and State Senator Janis Ringhand (D-Evansville), and previously worked for former-State Representative Ann Hraychuck (D-Balsam Lake). Prior to working in the Wisconsin State Legislature, Gau served as Deputy Political Director on President Barack Obama’s 2012 re-election campaign. JoAnne Anton currently serves as the Director of Charitable Giving for Herb Kohl Philanthropies. Anton began her career in public service at City Hall as an assistant to former Milwaukee Mayor John Norquist and went on to serve in various key roles for U.S. Senator Herb Kohl for more than two decades. Anton currently serves on the boards of Safe and Sound Inc, Harbor District Inc, and the Rotary Club of Milwaukee. Chuck Pruitt (Milwaukee) is a Partner and Co-Managing Director of the A.B. Data Group. Pruitt formerly served on the University of Wisconsin System Board of Regents, including terms as Vice President and President from 2007 to 2011. Pruitt is currently a member of the Board of Directors of the Herb Kohl Educational Foundation and the Board of Visitors of the LaFollette School of Public Affairs at the University of Wisconsin-Madison. Amy Traynor (Eau Claire) is an Instructional Coach in the Eau Claire Area School District and the 2012-13 Wisconsin Middle School Teacher of the Year. Traynor is the teacher lead for the Every Teacher a Leader Summit at the state and regional level. She currently serves as the President of the Wisconsin Teacher of the Year Network. Jan Allman (Marinette) is the President, CEO & General Manager of the Marinette Marine Corporation (MMC). Before joining MMC, Allman was the Vice President of Global Manufacturing at Navistar Corporation. Allman began her career at age nineteen at Ford Motor Company, where she worked for twenty-six years. Dr. Veronica Gunn (Milwaukee) is the CEO of Genesis Health Consulting and a board-certified pediatrician. Gunn has been in clinical practice for more than two decades, and previously served as the Vice President of Population Health at the Children’s Hospital of Wisconsin and was the Chief Medical Officer for the State of Tennessee’s Department of Health. Kevin Conroy (Madison) is the Chairman and CEO of Exact Sciences. Conroy previously served as President and CEO of Third Wave Technology after working as an intellectual property counsel at GE Healthcare and an intellectual property litigator in Chicago.